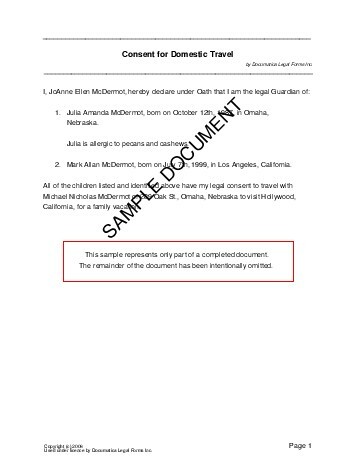 A Child Travel Agreement is used by the guardians of a child (e.g. the parents) to give permission for the child to travel domestically or overseas with another caretaker (e.g. a teacher, a relative). This agreement also provides a record of the child's information, such as birth date, passport number, medical conditions, and what to do in case of an emergency. This document will be governed by the laws of which nation? A child's legal guardian is the person whom they live with, and who takes care of them. In most cases, this is the parents, or a single parent if there is not joint custody. Is there only one guardian? Do both guardians have the same address? If there is a custody order or death certificate, the child should bring the original or a certified copy on the trip. Will the child(ren) be travelling internationally? Will the child(ren) be travelling with adult supervision? Will the child(ren) be travelling with both guardian(s)? In the event of an emergency, if you cannot be contacted immediately, will the accompanying adult have the authority to make emergency medical decisions for your child(ren)? Will this child be carrying a valid passport? Does this child have any special medical needs? What are these special medical needs (e.g. Mary is allergic to peanuts.)? What are these special medical needs? To ensure that your Child Travel Agreement is valid, have it sworn and signed before a Notary Public (do NOT sign it before visiting the Notary). Make sure to bring government-issued identification and copies of the child(ren)'s birth certificate(s). Will you be signing this document in front of a Notary Public? If this document is not Notarized, it may be invalid. Do you know when you will be signing this agreement? We strongly recommend obtaining an attorney reviewed Child Travel Consent directly from us. For maximum legal protection, obtain a lawyer reviewed Child Travel Consent directly from us.